Essence was in the room for the president's annual address to Congress. President Donald Trump aimed to strike a conciliatory tone and one of bipartisanship while touting his Administration’s accomplishments in his second State of the Union address before a diverse Congress. But a number of African American lawmakers, Democrats and progressives said Tuesday night’s speech was filled with contradictions. It lacked accountability, many pointed out, for decisions by the White House that have had an adverse impact on countless Americans, including the longest government shutdown in history. The president talked about domestic and foreign policy issues, ranging from the country’s newfound relationship with North Korea and removing troops in Syria and Afghanistan, to averting an arms race with Russia and trade with China. He spoke of investing in America’s crumbling infrastructure, and ending HIV/AIDS by 2030. He also noted the historic number of women serving in Congress. Touting “an unprecedented economic boom” Trump said his Administration has created 5.3 million new jobs–some 600,000 of them in manufacturing. But according to fact checkers at CNN, the boom isn’t necessarily because of his work. “He inherited a labor market in the later stages of a long recovery from the Great Recession, with fairly consistent job creation. Growth in monthly payrolls reported by the Bureau of Labor Statistics averaged 217,000 jobs under President Barack Obama’s second term, and under Trump it has averaged 203,000, pushing the overall unemployment rate to the lowest level since 1969 and unprecedented levels for people of color. The economy has added 4.87 million jobs since Trump took office, not 5.3 million, the number he cited,” CNN stated. The president also spoke of the nation’s criminal justice system and legislation such as the First Step Act—a bipartisan measure which gives non-violent offenders the chance to re-enter society. Trump signed the bill late last year. In discussing the issue of criminal justice reform, the president personalized it by citing two individuals—both Black–who have been incarcerated. Johnson served 22 years in prison, and Trump commuted her sentence back in June. Johnson, who was in the audience seated near First Lady Melania Trump, Ivanka Trump and other members of the president’s family, wiped away tears as members of both parties stood and applauded her. During the speech, Trump also honored military veterans, Holocaust survivors, families who have been victims of crime, a child with cancer and others. 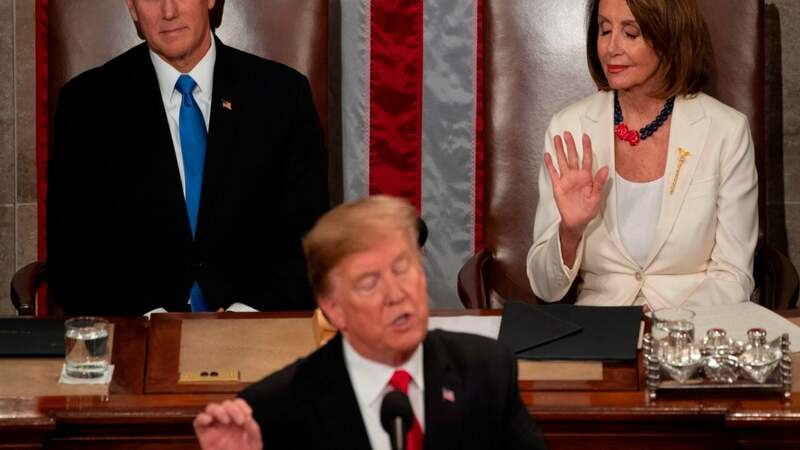 As Trump spoke, Republicans frequently cheered while most Democrats sat stoically. Democratic women were dressed in white to honor suffrage, while many African American lawmakers wore kente cloth accents. Afterward, some lawmakers said the president’s attempts at political reconciliation rang hollow because it does not jibe with how he has conducted himself over the last two years in office. The Congressional Black Caucus Chair, Rep. Karen Bass (D-CA) wasn’t impressed. “Within the first few minutes of his speech, the President touted getting families off of food stamps. He stood there just months after pushing an agenda to eliminate SNAP for families across America,” Bass told ESSENCE in a statement. “He mentioned many anniversaries but failed to mention that it’s the 400th anniversary of our ancestors arriving to this country enslaved. He said he was a defender of health coverage for those with pre-existing conditions, but it was less than two years ago when he pushed to repeal the very law that protects people with those conditions,” she said. “He brandished unemployment rates as if he had anything to do with them and governmental stability as if he didn’t just cause the longest shutdown in the history of this country. This isn’t to say the entire speech was a loss. He was right about deserving credit for having so many women walking the halls of Congress. I’m just not too sure he understands what those women are here to do,” she continued. Stacey Abrams, the recent Democratic candidate for Governor of Georgia, helped give the official Democratic response. She spoke of racism, which was not mentioned in Trump’s speech despite a rise in hate crimes. “We fought Jim Crow with the Civil Rights Act and the Voting Rights Act, yet we continue to confront racism from our past and in our present – which is why we must hold everyone from the very highest offices to our own families accountable for racist words and deeds – and call racism what it is. Wrong,” said Abrams. She went on to say that “ even as I am very disappointed by the President’s approach to our problems – I still don’t want him to fail. But we need him to tell the truth, and to respect his duties and the extraordinary diversity that defines America. Our progress has always found refuge in the basic instinct of the American experiment – to do right by our people. And with a renewed commitment to social and economic justice, we will create a stronger America, together,” she said. Top ranking Democrats—among them Senator Chuck Schumer (D-NY) and Rep. Elijah Cummings (D-MD)—also indicated they found the speech lacking. And some Democrats, among them Reps. Maxine Waters (D-CA) and John Lewis (D-GA), skipped the event. Mandela Barnes, the Lieutenant Governor of Wisconsin, delivered the Working Families Party response to the State of the Union. Kelly said the decision, of course, is also that of the Commander in Chief.